Why Police Departments Have A Hard Time Recruiting Blacks Since the Ferguson, Mo., shooting, there have been renewed calls for police departments to hire more blacks and other minorities. But recruiters say there's a shortage of candidates. 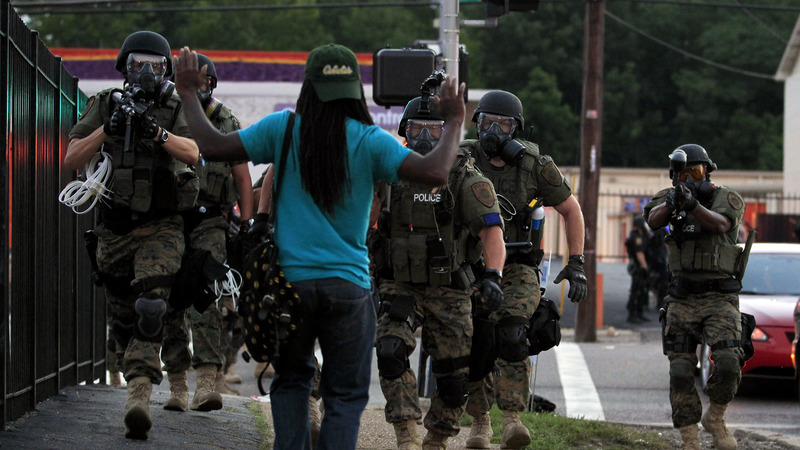 Police wearing riot gear walk toward a man with his hands raised Aug. 11 in Ferguson, Mo. Renewed calls for police departments to hire more minorities have followed the shooting there of a black man by a white police officer. The most stubborn diversity problem seems to be in the inner-ring suburbs — places where the population has shifted to majority minority, but that are still served mainly by white police. White police such as St. Louis County officer Erich Von Almen. In the days after the August protests in Ferguson, he and his white colleagues were on patrol in Jennings — a neighboring suburb that's also mostly African-American. He says he understood the outcry for more black officers in communities such as this but that it's easier said than done. "We can't get more black officers. We recruit predominantly at black schools, the military, and for the life of me I don't know why. It's not the best-paying job; they'd probably do better in the private sector. That's all I can think of. But I know it's not for the lack of trying," he says. You hear that a lot in America's inner-ring suburbs: Departments say they just can't attract enough minority applicants. Cedric Alexander, the public safety director in DeKalb County, Ga., got his start in policing and admits that there's something to this complaint. "Many young people today, particularly of color, have far more opportunities" professionally now than 40 years ago, he says. We can't get more black officers. We recruit predominantly at black schools, the military, and for the life of me I don't know why. Alexander got his first police job in the 1970s. Today he's the president of the National Organization of Black Law Enforcement Executives. "When I first came on, relationships were certainly much more strained — or just as strained — between communities of color and police at that time," he says. But back then, he says, young black people saw joining the police as a way to change things. "And during my generation, that's what we did," he says. Today, Alexander finds young black people more likely to dismiss the idea of becoming a police officer — but he says that's no excuse to give up on diversity. He says recruiters just have to try harder to win over prospects such as Andrea Dave. As a black woman, Dave is especially in demand. But even though she's a criminal justice major at Harris-Stowe State, a historically black university in St. Louis, she doesn't sound very excited about joining a police department. "I mean, if you get into a majority-white police force, you think they're going to be racist. If you get in a majority-black police force, you think they're going to be crooked. It's not really an appealing job anymore like it was when you were younger growing up," she says. Kevin Minor, a recruitment officer for the St. Louis County Police Department, says anti-police feelings run strongest when he talks to young people in a group. "Good luck cracking that. Because everybody's playing their role. You got the class clown, you got the 'I don't care,' you got the 'I don't like the police.' You might have one of them that's interested in the career field, but they can't say anything because of peer pressure or whatever," Minor says. When that happens, he says, he tries to catch likely prospects one on one. The fact that Minor is black doesn't make things easier; he says when he was on crowd control during the Ferguson unrest, black protesters called him an Uncle Tom. But those feelings aren't universal in the black community. Benny Newsom, also a criminal justice major in St. Louis, says Ferguson didn't sour him on becoming a policeman. "I think that it kind of enhanced my urge to actually go further in law enforcement," Newsom says. But he doesn't think diversity by itself will solve the crisis in confidence in the police. "It'd ease the tensions up a bit. But at the same time, they can't be too trigger-happy," Newsom says. Rather than focusing on being a black officer, Newsom talks about wanting to be part of a new generation of American police — a generation that's more community-oriented and less prone to using force.